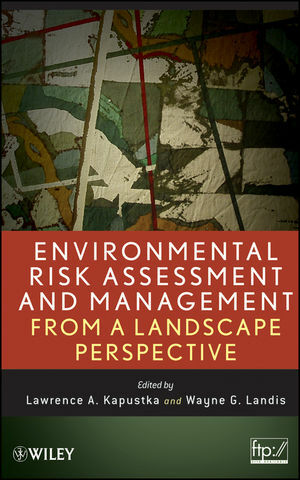 With material that is accessible across all knowledge levels, Environmental Risk Assessment and Management from a Landscape Perspective moves beyond looking solely at chemical contaminants to diagnose environmental threats, and aims to accomplish practical risk assessment in a manner that supports long-term sustainable management. Lawrence A. Kapustka is Senior Ecologist/Ecotoxicologist for LK Consultancy. He has published extensively on risk assessment methods, ecotoxicology, and ecology. He is a member of ASTM International, Ecological Society of America (ESA), Society of Risk Analysis, and Society of Environmental Toxicology and Chemistry (past chair for Ecological Risk Assessment Advisory Group). He serves on the Science Committee of ESA and editorial boards of several societies. Wayne G. Landis is Director and Professor of the Institute of Environmental Toxicology at Western Washington University. He has published extensively and is a Fellow of the Society for Risk Analysis and a member of the Society of Environmental Toxicology and Chemistry. Dr. Landis is also an area editor for environmental risk assessment for Risk Analysis and is a Founding Editor of Integrated Environmental Assessment and Management. Currently, he is serving on the EPA Science Advisory Boards for Ecological Processes and Effects and Science Integration for Decision Making. Chapter 01. Introduction (Lawrence A. Kapustka and Wayne G. Landis). Chapter 02. Risk Assessment (Lawrence A. Kapustka). Chapter 03. Population, Habitat, and Ecological Systems (Lawrence A. Kapustka). Chapter 04. Relevance of Spatial and Temporal Scales to Ecological Risk Assessment (Alan R. Johnson and Sandra J Turner). Chapter 05. Quantitative Measures and Ecological Hierarchy (G. Darrel Jenerette and Jianguo Wu). Chapter 06. Bayesian Models in Assessment and Management (Jannicke Moe). Chapter 07. Linking Regional and Local Risk Assessment (Rosana Moraes and Sverker Molander). Chapter 08. Integrating Health in Environmental Risk Assessments (Kenneth L. Froese and Marla Orenstein). Chapter 09. Valuing Wildlands (Rebecca A. Efromson, Henriette I. Jager, and William W. Hargrove). Chapter 10. Predicting Climate Change Risks to Riparian Ecosystems in Arid Watersheds: The Upper San Pedro as a Case Study (Hector Galbraith, Mark D. Dixon, Juliet C. Stromberg, and Jeff T. Price). Chapter 11. Invasive Species and Environmental Risk Assessment (Greg Linder and Edward Little). Chapter 12. Landscape Non-indigenous Species Risk Assessment: Asian Oyster and Nun Moth Case Studies (Wayne G. Landis, Valerie C. Chen, Audrey M. Colnar, Laurel Kaminski, Goro Kushima and Ananda Seebach). Chapter 13. Ecological Risk Assessment of the Invasive Sargassum muticum for the Cherry Point Reach, Washington USA (Ananda Seebach, Audrey M. Colnar and Wayne G. Landis). Chapter 14. Integrated Laboratory and Field Investigations: Case Study—Assessing Contaminant Risk to American Badger (Dale J. Hoff, Deborah A. Goeldner, Michael J. Hooper). Chapter 15. Environmental Risk Assessment of Pharmaceuticals (Joanne Parrott, Alison Mclaughlin, David Lapen and Edward Topp). Chapter 16. Economic Analysis of Ecological Goods and Services (Ronald J. McCormick, James Pittman, and Timothy F. H. Allen). Chapter 17. Ecosystem Service Valuation Concepts and Methods (James Pittman and Ronald J. McCormick). Chapter 18. Metrics and Indices for Sustainable Social – Ecological Landscapes (Ronald J. McCormick). Environmental Risk Assessment You will find here supplementary material to Environmental Risk Assessment and Management from a Landscape Perspective.